Easily adjust camber and caster trackside with Vorshlag camber/caster plates. Oversized spherical bearings are designed to withstand the rigors of street and track abuse. All components are plated for maximum corrosion resistance and long life. In order to properly use Vorshlag camber plates, you must choose spring perches that match your strut brand and spring type. Vorshlag camber plates are designed to be compatible with 2.5”, 2.25" and 60mm “coilover” style springs, stock style springs (all E30) and all strut types. We make over a dozen variations of these E30 camber plates to work with your E30 set-up! Compatible with 2.5", 2.25" and 60 mm coilover springs, factory springs (both M3 and base model), and all struts. No need to change camber plates when switching from regular springs to coilovers! Some companies sell you two totally different camber plates for coilover springs and factory style springs. Installs with basic hand tools, no chassis modifications required. Plates are designed specifically for BMW E30 chassis. Camber is easily adjustable at the track from the engine compartment with simple hand tools. No need to reach inside the wheel well with a wrench! The spherical bearing used in the Vorshlag camber plate is the largest used in any BMW camber plate. The result has much better durability and wear characteristics than the undersized bearings used in our competitors plates. Designed for maximum suspension bump travel. More than an inch more strut travel than some of our competitors! CNC machined bearing holder, Laser Cut main plate, 100% alloy steel construction - Tough as a German Tank! All components plated for maximum corrosion resistance and long life. Spring Perches: Please pick the spring perch diameter that works with the springs you have. Coilover springs typically come in one of three diameters: 2.25", 60mm and 2.5". Ground Control coilovers are supplied with 2.5" dia and TCKline supplied coilovers are 60mm dia springs. KWs coilovers tend to be 60mm but some of these and some Bilstein PSS series coilovers use the OEM upper perch (a tapered spring - see pics below). The 95 M3 and the E30 share the same spring perch. Strut Style: Please pick your strut brand and sizes from the drop down below. This helps us build the spring perches to fit your struts with a tight tolerance and no slop - for quiet, reliable use. 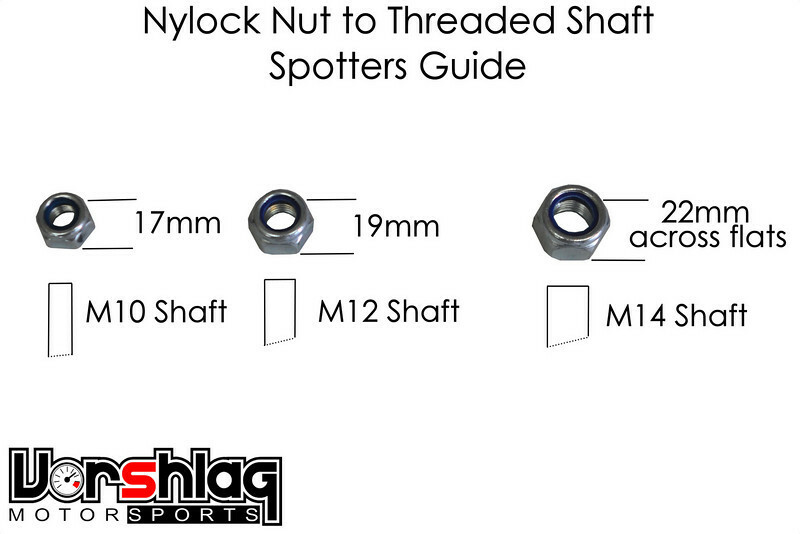 If you do not know what struts you have please have a reputable BMW shop inspect them, as most mechanics can spot the differences with a quick look. There are also new struts and updates to existing models that come out from time to time. If your strut is not listed, please pick the "Other" option and let us know what brand and model struts you have in the order notes. Note: Koni makes struts for some BMWs with both tapered and square shaft shoulder transitions, so if you have Koni struts please inspect your struts before ordering (or let us know when and where they were purchased, which helps us determine what style to build for). 1/4" T-Handle Wrench: This is the tool you need to adjust your camber plate bolts on some Vorshlag camber plate designs, including: Mini, BMW E30, and Mustang. 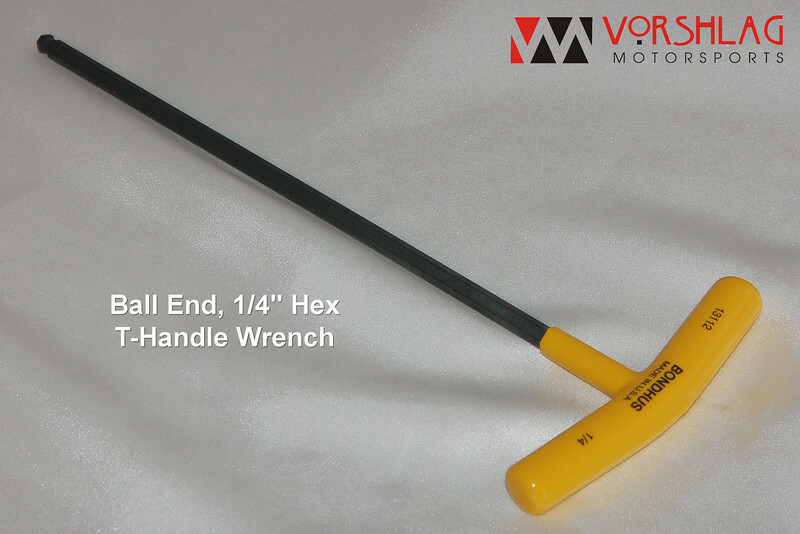 This high quality hex wrench comes with a "ball" end that can engage the Allen Head bolts at an angle - helpful when the factory has a small strut tower opening or if you have a strut brace covering part of the top of the strut tower. 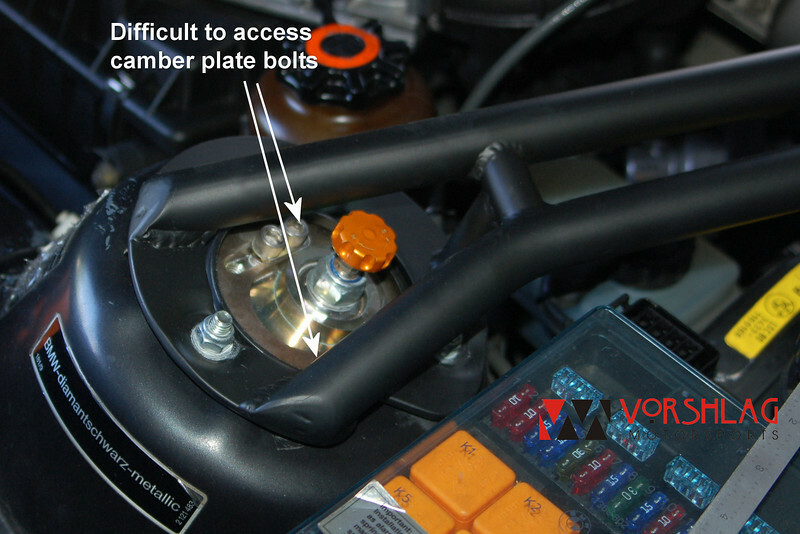 Our Subaru and Evo 8/9 camber plate designs can also use this tool, but it isn't needed unless you have a strut brace covering part of the strut tower opening. Vorshlag branded products are built to order and most are tailored to match your specific application. We CNC machine parts in house, use outside vendors for platings/coatings and laser cut parts, and the bearings and hardware comes from various sources. Due to the myriad variety of components required for different applications, it is possible that delays can occur in the fulfillment of your order. Please contact us before placing your order if you have a time constraint.